…and if they start going on about Frank Pick and his architecturally significant partnership with Charles Holden (a partnership which produced, amongst others, the concrete cathedrals at Cockfosters and Uxbridge) then you’ll know they don’t really know their stuff. 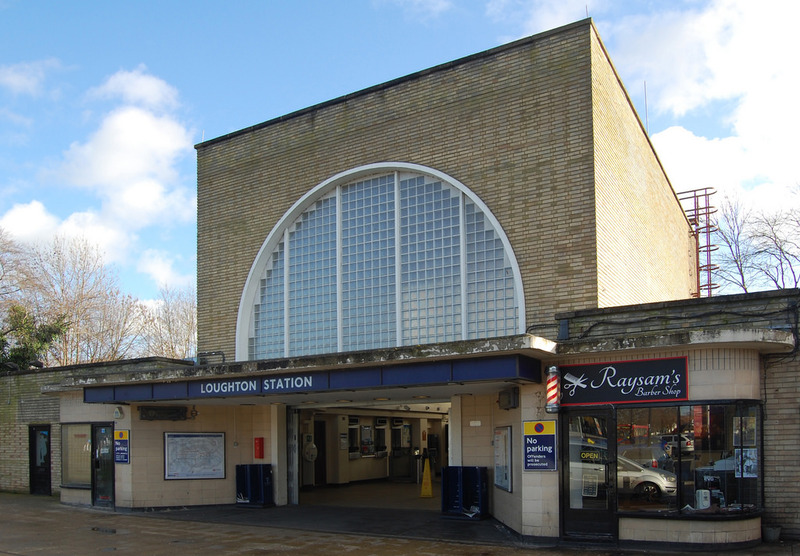 Loughton is the pre-war Art Deco London Underground station that isn’t by Holden. Nor is it strictly pre-war. The actual design is, but construction wasn’t completed until 1940. Nor, to be strictly accurate, is the station a London Underground design at all. 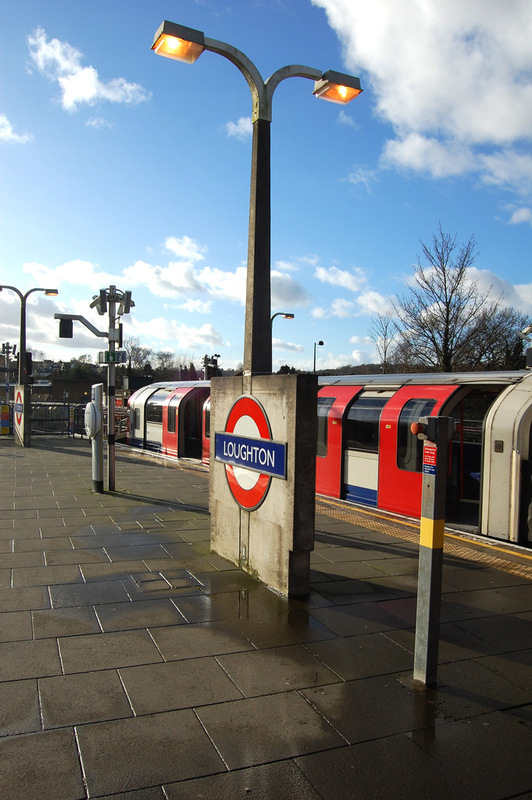 Loughton station is a product of London Underground’s 1930s programme of line extensions. 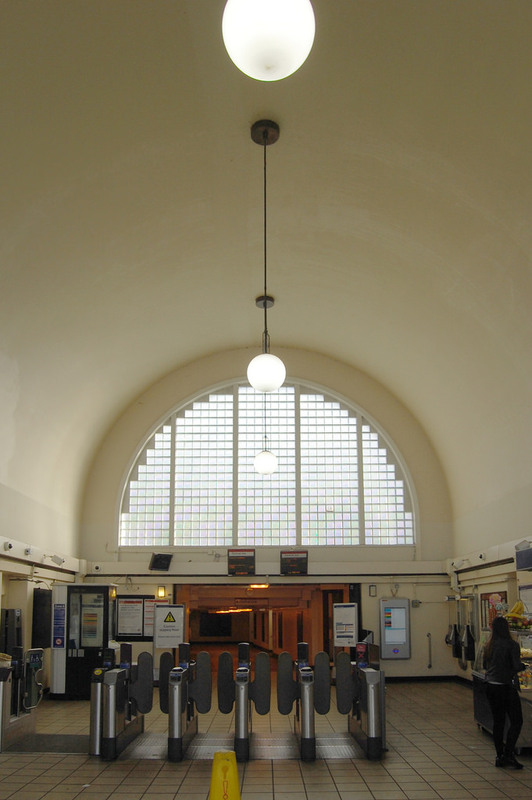 The same programme led to the Piccadilly Line’s northern extension where London Underground managing director Frank Pick’s preferred architect Charles Holden delivered a series of Art Deco/Modernist (depending on exactly which source you read, and how you classify the two styles) stations. These are the “brick boxes with lids” to be found all the way up the extension until Cockfosters itself at the end of the line. Loughton, however, was designed by Scottish architect James Murray Easton. 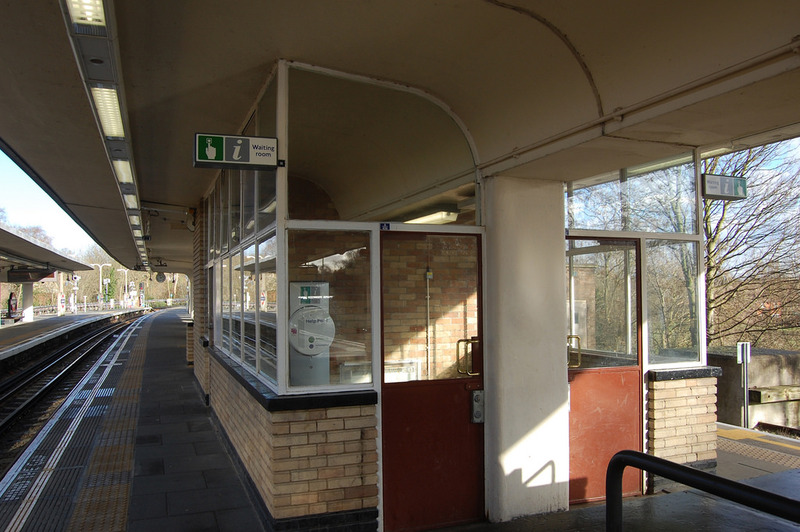 Like Holden’s works, Loughton station’s ticket hall is also a brick box as seen from the outside, but the lunette windows (one at the front and one at the back of the ticket office) don’t look like Holden’s glazing patterns. Inside, Holden’s brick boxes are open all the way to the roof. Easton’s ticket office is a big barrel vault, with lighting globes hanging down. There’s something of an American Union station atmosphere in the ticket office, albeit much more simply decorated and on a much smaller scale. It’s not surprising; the Union stations were an influence on the design of many railway stations outside America in the run up to the war, when Loughton’s design was drawn up. The Central Line was planned for extension as part of London Underground’s New Works programme of the 1930s. The line (which already ran east to west in tunnel under Central London) would be extended at each end until it connected up with existing suburban railways operated by the steam trains of mainline railway companies. These lines would be electrified and their services taken over by the Central Line, resulting in faster and more frequent trains for passengers, and new journey opportunities from east to west London, without needing to change trains at mainline London termini. If that sounds familiar, it’s because the concept is currently being employed again on London’s east-west Crossrail scheme, due to open in 2018. Crossrail will take over suburban services to Reading (west of London) and Shenfield (to the east), linking them together through a new tunnel under central London. The Central Line’s eastern extension as delivered by the New Works programme was planned to project to Epping and Ongar, over lines operated by the LNER (London and North Eastern Railway). 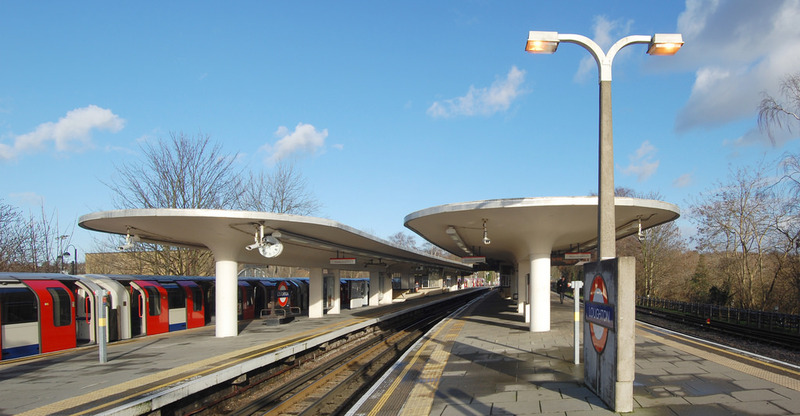 A new tunnel link was also planned between Leytonstone and Newbury Park where a fabulous modernist bus station was later constructed in 1949. If you travel on the eastern extension of the Central Line today, you’ll find that most of the LNER stations that were taken over by London Underground still look exactly like small LNER stations. The signage and the paint schemes might have changed, but there’s no disguising their history. In fact, sometimes it’s like finding yourself on a heritage railway, an illusion then disorientatingly shattered by the arrival of a modern electric London Underground train. But there’s one station which looks modern, despite being over 70 years old, and that’s Loughton. Once the LNER had agreed with London Underground that services along the line to Ongar would be transferred to the latter’s operation over the next few years, the former found itself as only the short-term custodian of the stations on the line. Loughton needed to be rebuilt because larger premises were required to fulfill its new role as an Underground station. It made sense for the LNER to agree with London Underground that the design would reflect the style that Holden had developed, given that London Underground would soon be taking the station on. However, the LNER was under no obligation to employ Holden himself. Instead, it selected Easton, of Stanley Hall, Easton and Robertson, which is why Loughton was designed by him rather than Holden, and the style is similar but not quite the same. Easton and Holden have a lot in common, actually. Both were artists in the medium of concrete. Easton had earlier designed the extraordinary Lawrence Hall for the Royal Horticultural Society in London, which is a complicated and beautiful design, even more striking (I hate to admit) than Holden’s Cockfosters. But it’s not a transport building so it doesn’t qualify for this blog. 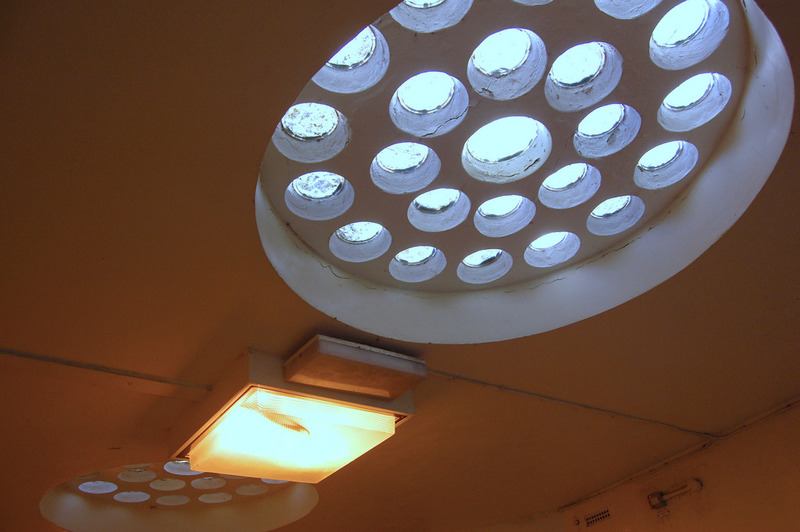 Back at Loughton, the ticket hall and the platforms are linked by a short passageway lit by some amazing skylights. According to the Twentieth Century Society’s website, the round glass elements might once have been railway signal lenses. 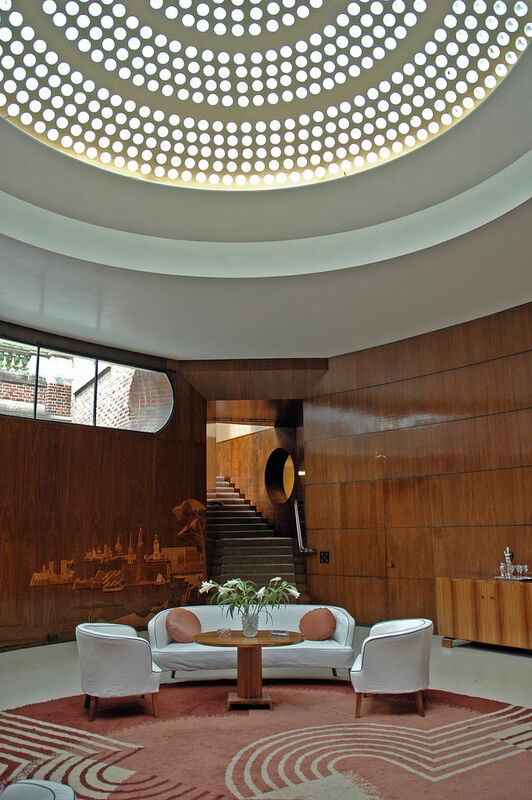 Multi-lensed skylights are a feature that can be seen elsewhere, not least in the Art Deco masterpiece which is Eltham Palace in south-east London. There are some lovely old London Underground signs pointing up to the platforms at Loughton, while up on the platforms themselves, the canopies are supported by slender columns running along the centre line. Holden’s tend to be partly supported by waiting rooms built underneath, usually with streamlined rounded ends. Easton’s waiting rooms at Loughton are perhaps less successful, being glazed in elements under the roof. They are less elegant than Holden’s waiting rooms, but their position gives them an unusual butterfly ceiling. Because the New Works programme was delayed by the Second World War, it took until 1948 before the Central Line actually took over services on the LNER route through Loughton. Between 1940 and 1948 then, there was the incongruous sight of old LNER steam trains calling at a brand new modern station, clearly designed to serve a modern electric railway network. Loughton station was listed in 1994 having been extensively refurbished in the mid 1980s. 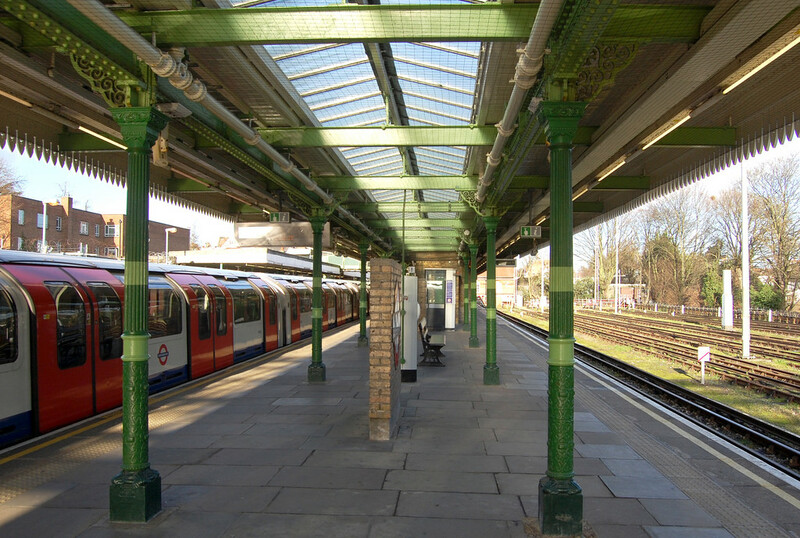 Although the refurbishment and listing have ensured the station’s future, the repairs to the canopies sadly led to the covering of glass lens skylights similar to those illustrated earlier, which originally ran all the way along the edge of the canopies (they can be seen on photos of the station in its original condition, here). Despite that loss, it’s still one of the most stylish of London Underground stations, and not one of the better-known ones. Its design is all the more notable because it stands alone in a sea of old-fashioned steam railway architecture. If you do pay it a visit, just keep an ear out for any know-it-alls who are boring their companions with the story of Charles Holden’s London Underground station architecture. And if they do, try not to chuckle too loudly. Unique – Art deco would you call the London Underground style?